David Malo, one of the early native Hawaiian scholars, was the son of Aoao and his wife Heone, and was born in Keauhou, North Kona Hawai‘i; his father had been soldier in the army of Kamehameha I. The exact year of his birth is not known, but it was about 1793, around the time of Vancouver’s second visit to the islands. 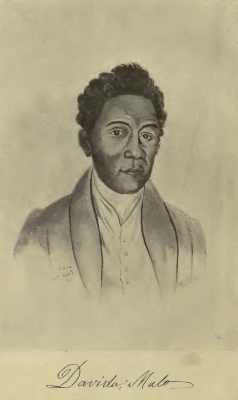 During his early life Malo was connected with the high chief Kuakini (Governor Adams,) who was a brother of Queen Ka‘ahumanu. In 1823, Malo moved to Lāhainā, Maui where he learned to read and write. Malo soon converted to Christianity and was given the baptismal name of David. In 1831, he entered Lahainaluna High School (at about the age of 38;) the school opened with twenty-five students, under the leadership of Reverend Lorrin Andrews – he graduated in the class of 1835. From about 1835, he started writing notes on the Hawaiian religion and cultural history, along with other members of the school and instructor Sheldon Dibble. Malo came to be regarded as the great authority and repository of Hawaiian lore and was in great demand as a story-teller of the old-time traditions, mele, and genealogies, and as a master in arrangements of the hula. The law which first established a national school system was the “Statute for the Regulation of Schools” which was enacted on October 15, 1840, and was reenacted, with some important amendments, on May 21, 1841. Malo was appointed as the general school agent for Maui; he was then voted to be in charge of all the general school agents, therefore becoming the first superintendent of schools of the Hawaiian kingdom (where he served at least until the middle of 1845. After being ordained to the Christian ministry, he settled down in the seaside village of Kalepolepo on East Maui where he remained until his death in October 1853. His book, Hawaiian antiquities (Moolelo Hawaii – 1898,) addressed the genealogies, traditions and beliefs of the people of Hawai‘i.